Congratulations and best wishes as you	plan your wedding day! 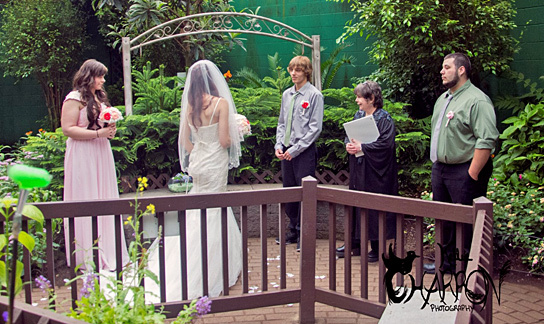 Wedding ceremonies are held at	The Butterfly Place before or after hours, when you may rent the butterfly flight area for approximately one hour. Please contact Sylvia Leslie, Justice of the Peace / Wedding Coordinator as far in advance as possible to arrange a time for your ceremony and to schedule a meeting. 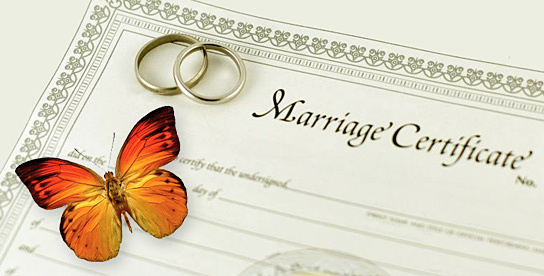 There is no place available for a reception at The Butterfly Place; however, Sylvia will be happy to suggest places nearby which may host a beautiful and memorable reception. Just the two of you? Please call Sylvia for price. How many guests may be accommodated at The Butterfly Place? The Butterfly Place is a natural garden setting with a winding pathway. There are no chairs, but there are some benches and we have some folding chairs available if you have a guest or two who are unable to stand. The natural setting has a beauty all its own. If you have an idea for something you wish to add, please discuss this with Sylvia. There is a CD player available. You may bring your own music or Sylvia can provide simple “traditional” music for the ceremony. Live musicians are very welcome. Please note: If you burn your own CD, you’ll want to bring your own machine or try the CD on our machine in advance to ensure compatibility. In addition, musicians may want to check out where electrical sources are available in the flight area, if needed, to confirm that they are suitable. It is suggested that if a photographer has never been to The Butterfly Place before, he or she should arrange a time with Sylvia before the special day to visit. In addition, couples should work with their photographer and be very specific about what they want. For example, do you want pictures taken during the ceremony? Do you want formal portraits or a more informal “capture the moments” approach? Will you be taking formal portraits of the wedding party only? When may our guests arrive? Are you planning to have “just the two of you” or a witness or two as you share vows? 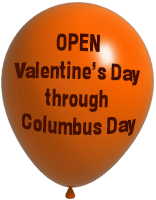 with any questions or call (978) 392-0955. Thank you!